Welcome to the Holiday Inn Express and Suites Hotel in Butte, MT. The hotel is perfect for both business and leisure travelers staying in southwestern Montana. We are conveniently located at the intersection of Interstates 90 and 15 right off the Harrison Ave. exit. The hotel is near a variety of local shopping and restaurants. Experience all that Montana has to offer. Butte, MT is centrally located between Glacier National Park and Yellowstone National Park. Enjoy Butte's rich mining history by stopping at the World Museum of Mining or view the massive splendor of the Berkley Pit Mine. 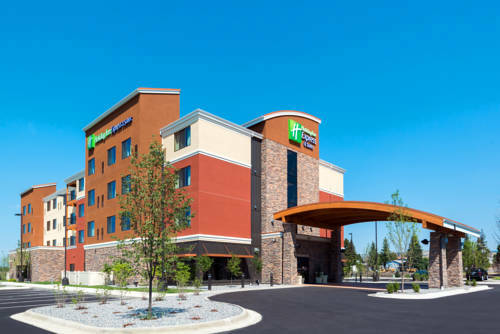 The Holiday Inn Express and Suites Butte hotel is also the perfect location for year round events including the Montana Folk Festival, Evel Kneivel Days, The Freedom Festival, and St. Patrick's Day. Our Hotel features 84 spacious guestrooms including 23 suites, with 42" HDTVs, free wired and wireless high-speed internet, complimentary hot breakfast featuring our signature pancakes and cinnamon rolls, business center, guest laundry, fitness center, meeting space, and indoor pool and spa. Stay Smart at the Holiday Inn Express & Suites Butte, MT!